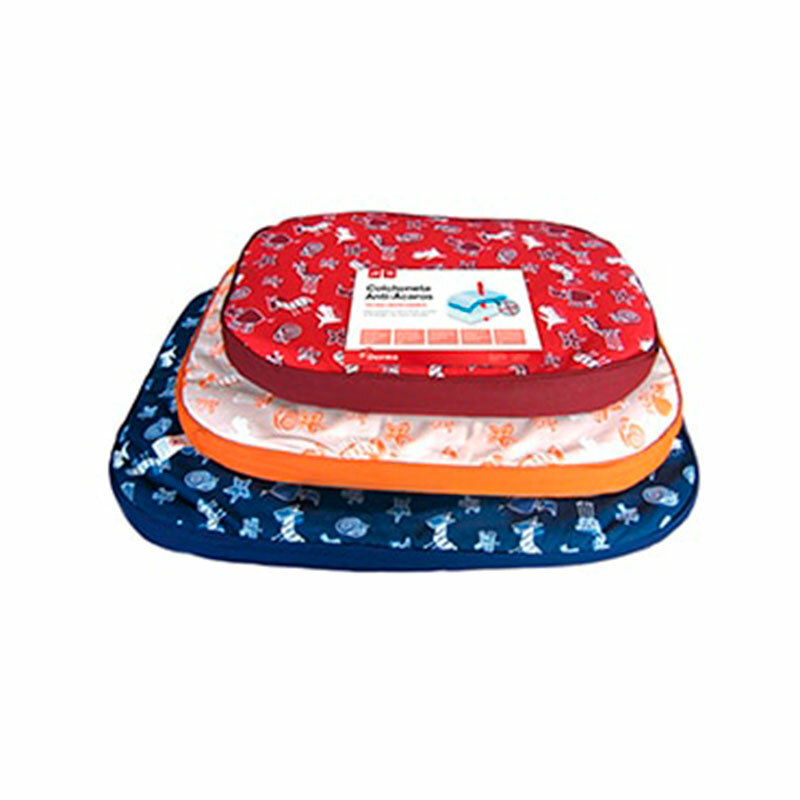 Bed for dogs rectangular anti-mites of exceptional quality. Dust mite allergy affects more than 8% of dogs and cats and can appear throughout the life of the animal. Dust mites inhabit tapestries, blankets and carpets. They penetrate through the skin of animals, and cause the allergic reaction that causes itching and irritation on the animal's skin. On a standard mat with more than 1 year of use, up to half a million mites can penetrate the tissue and, thanks to moisture, heat, skin rashes of the animal, proliferate on the surface and in the interior Of the mattress. Pets spend more than 50% of the day in the resting phase, so their beds should help prevent possible allergy problems. This bed for dogs is made with an innovative fabric developed with Microair® Technology. It is a fabric made of very tight weave polyester microfiber, which certifies the total impermeability to the allergens and at the same time allows the permeability of the water vapor, facilitating the perspiration and avoiding the accumulation of humidity, as well as a wide passage of air. S: 51 x 70 cm. LETIPharma is a bio-pharmaceutical research company, independent and family capital. In its different areas of expertise, seeks to provide society with products that add value to health care. Its headquarters are in Barcelona and the industrial plant and the allergy research laboratory are in Tres Cantos (Madrid). It has subsidiaries in Germany (Ismaning and Witten) and in Portugal (Oporto). LETIPharma operates with exclusive distributors in various countries in Europe, Latin America and Africa. Research and specialization are critical elements in the strategy of LETIPharma. Having innovative and patented products is essential to grow internationally in the chosen market segments. Therefore, LETIPharma has been devoting to research and product development between 10 and 20 percent of its turnover. Internationalization is an essential element of our strategy. For a specialized company, penetrating foreign markets is a requirement to be able to grow, and this is facilitated by having our own products derived from research. Thus, for LETIPharma, internationalization is both a necessity and an opportunity, as well as being an important enriching element for your organization. LETIPharma maintains a strategy of close and lasting collaborations with companies in the sector to boost its penetration in foreign markets and to expand its range of products. Also, with universities and research centers, for research and development projects, inside and outside of Spain. LETIPharma is a founding member of Asebio (Spanish Association of Biocompanies) and of the EAMG (European Allergens Manufacturers Group), is a partner of Farmaindustria, of FENIN (Spanish Federation of Health Technology Companies) and of BPI (Bundesverband der Pharmazeutischen Industrie) and contributes to various organizations and non-profit foundations in areas related to health and education.